The volume of natural gas associated with North Dakota oil production is increasing so rapidly, construction of pipeline and processing capacity is unable to keep up, prompting state officials to look for alternative methods to address the problem. Regulations currently require producers to capture 85 percent of the natural gas, a target which will increase to 88 percent on November 1. Justin Kringstad, director of the ND Pipeline Authority told members of the North Dakota Industrial Commission yesterday it’s going to be tough to achieve the goal. He said improved drilling techniques and the fact most activity is in the “Bakken core” where gas-to-oil ratios are higher, has caused the state’s natural gas production to soar. Midstream companies added about 1 billion cubic feet of processing capacity during the slowdown between 2014 and 2016, which helped the industry catch up, but Kringstad said the situation changed in early 2017. Lynn Helms, Director of the Department of Mineral Resources, said as drilling continues in areas where gas-to-oil ratios are higher, natural gas production will continue to climb, making it difficult for midstream companies to keep up. “It’s not a race where we’re just going faster than the drilling and catch up, we’re actually going to have to accelerate investment in order to move ahead of this curve,” Helms said. The discussion prompted Governor Doug Burgum to suggest state officials get together with the industry to brainstorm a solution. 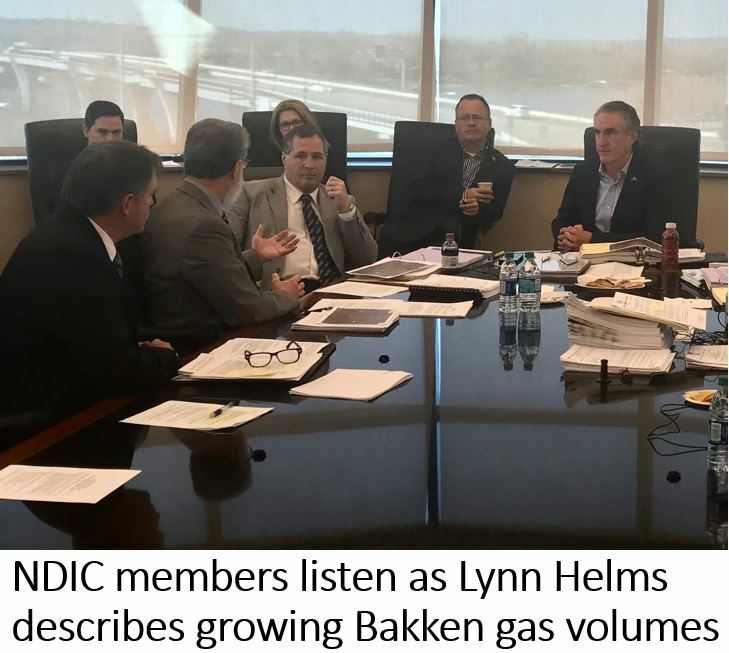 The NDIC took no action at the meeting, but urged state regulators to meet with the ND Petroleum Council’s industry flaring task force, and include the Department of Commerce to consider value-added opportunities for energy development. 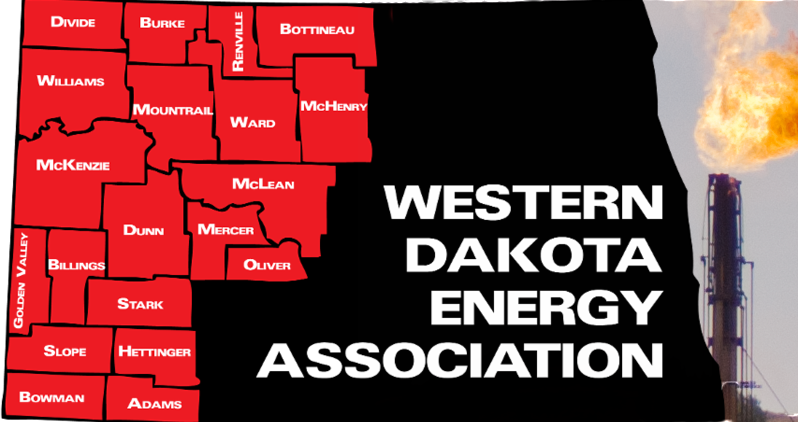 Guests attending the annual meeting of the Western Dakota Energy Association will hear about the latest efforts by midstream companies to process and transport North Dakota’s growing natural gas production. The WDEA annual meeting will be held Wednesday and Thursday, November 7-8, at 4 Bears Casino and Lodge in New Town. The Wednesday afternoon agenda features a panel discussion moderated by ND Pipeline Authority Director Justin Kringstad, who will kick off the session with an overview of current production, and processing and pipeline capacity. Guests will then hear from speakers representing three midstream companies – Diaco Aviki with Crestwood Midstream Partners, Will McCuistian with ONEOK Rockies Midstream, and Jason Swaren representing Oasis Petroleum – who will describe their companies’ recent and planned investments in North Dakota. The agenda also includes a presentation by Kayla Danks, BIA Superintendent for the Ft. Berthold Agency, who will provide an overview of the permitting situation on the reservation. Guests will also hear from Travis Hallam, pipeline director for the MHA Nation, as well as Brent Lohnes, manager of ND operations for Hess Corporation, who will review the latest research efforts into pipeline leak detection and prevention technology. Online registration is now open with an early registration fee of just $75.00. Discounted lodging is also available by mentioning the Western Dakota Energy meeting. Call (800) 294-5454 to book a room. 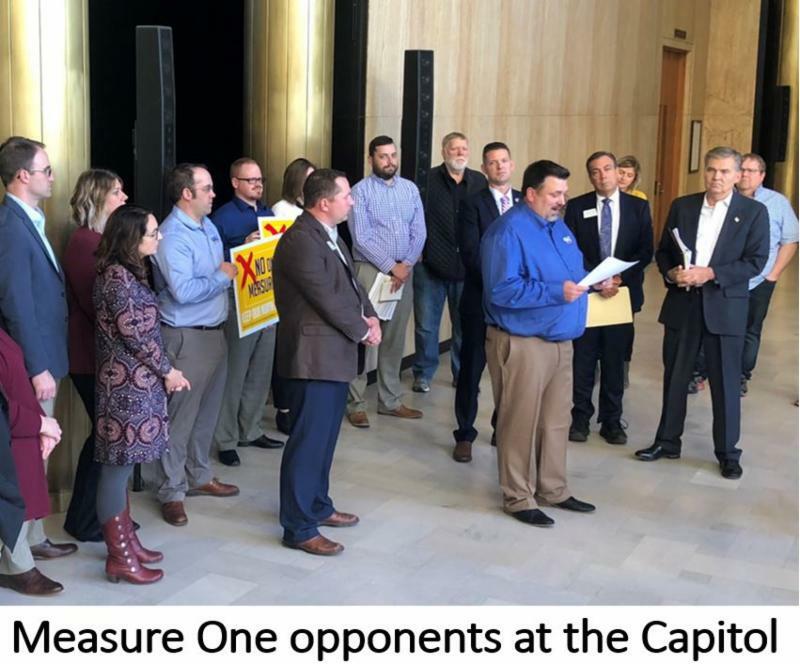 Opponents of Measure 1 held a news conference at the Capitol this week to announce growing opposition to the ballot measure which would force ordinary citizens and private charities to report details of their political involvement to the state. That language would required detailed reports from individuals, charities, trade unions, news media, bloggers, and even churches and religious groups that provide adoption or foster care services in partnership with the state, according to Simon. More than 40 organizations have stepped up to publicly oppose the measure. Among the latest to join are the ND Association of Realtors, the ND Implement Dealers Association, the State Association of Nonpublic Schools and the North Dakota Chapter of the NRA. Click here to learn more. 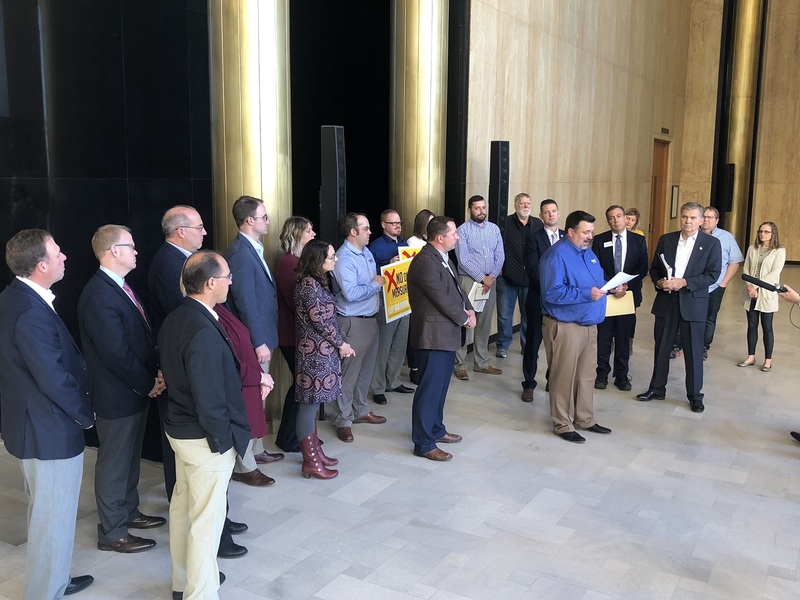 The North Dakota Association of Rural Electric Cooperatives (NDAREC) is urging a ‘NO’ vote on Initiated Constitutional Measure No. 1, which appears on the November general election ballot. NDAREC Executive Vice President Josh Kramer, in an interview this week on the radio program What’s On Your Mind, said the association’s board voted to oppose Measure 1 because of concerns it would limit the co-ops’ ability to advocate on behalf of their members. Click here to listen to Kramer’s comments. NDAREC is the statewide trade association for 16 electric distribution cooperatives and five generation and transmission cooperatives operating in North Dakota. The distribution cooperatives provide electricity to nearly 250,000 North Dakotans via 196,000 meters. Click here to read the NDAREC news release. 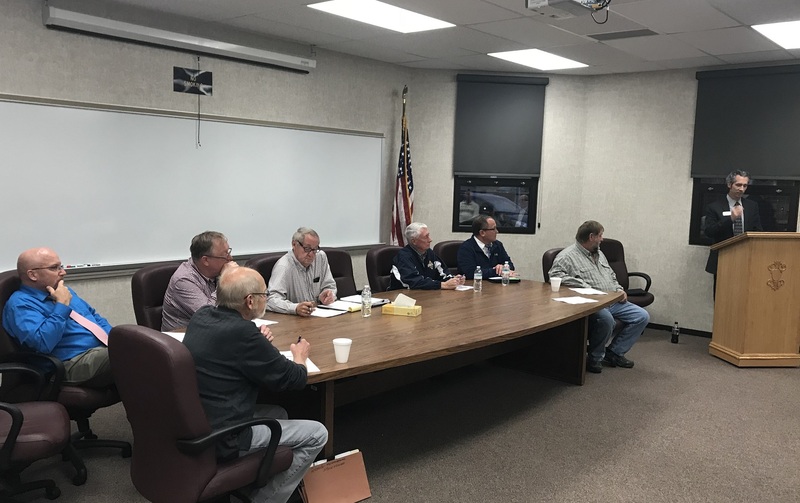 Members of North Dakota Association of Coal Conversion Counties held their annual meeting Wednesday evening in Washburn to elect board members and discuss issues likely to arise in the 2019 legislative session. Members in attendance re-elected the current slate of officers, led by chairman John Phillips, who represents the city of Beulah, and vice-chair Brad Rinas, superintendent of the Washburn Public School District. 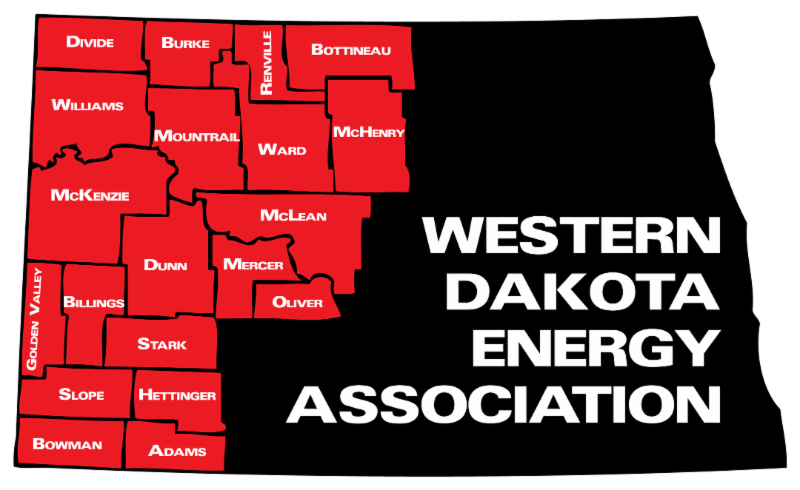 The CCC Association is part of the Western Dakota Energy Association, and Phillips and Rinas are its representatives on the WDEA Executive Committee. Click here to see other members of the board. 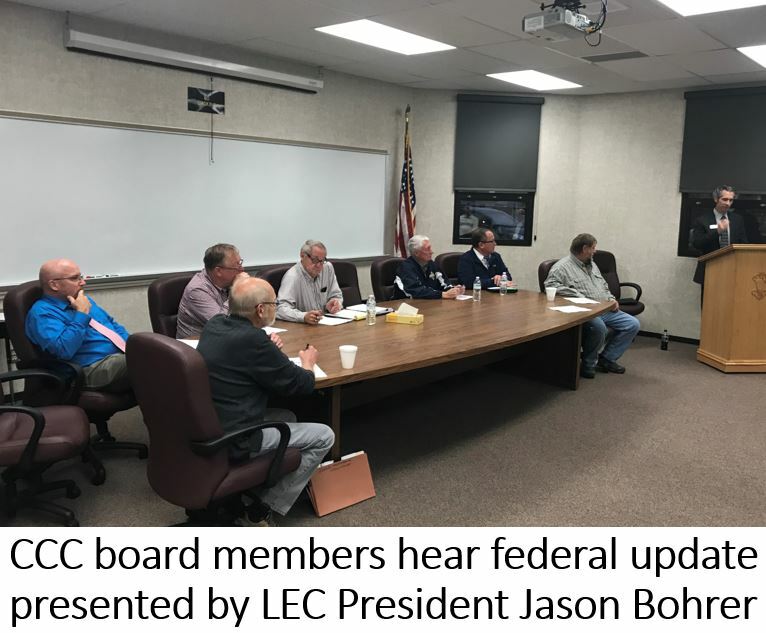 Guests at the meeting heard an overview of federal regulatory policy affecting the coal industry from Lignite Energy Council President Jason Bohrer. The LEC’s Director of Research and Development Mike Holmes also provided an overview of the latest power plant technology, and research aimed at developing new uses for lignite coal. Senator Howard Anderson, R-Turtle Lake, was also on hand to share his views on the upcoming legislative session. WDEA Executive Director Geoff Simon reviewed likely legislation, including an overview of the infrastructure bill known as “ Operation Prairie Dog. ” He also discussed legislation that would give the state a share of wind tax revenue, all of which now stays in the county where a wind farm is located. During the board discussion that followed the annual meeting, members talked about the need to be more actively engaged in the legislative process because of ongoing threats to the coal industry, and declining tax revenue impacts in the three coal-producing counties. The state Workforce Development Council gave Governor Doug Burgum an extensive list of recommendations this week to help shape the state's workforce policy to meet current and future needs. The report contains recommendations, as well as endorsements of other initiatives already in progress. It's the culmination of 11 months of study coordinated by Michelle Kommer, Labor Commissioner and Executive Director of Job Service North Dakota. 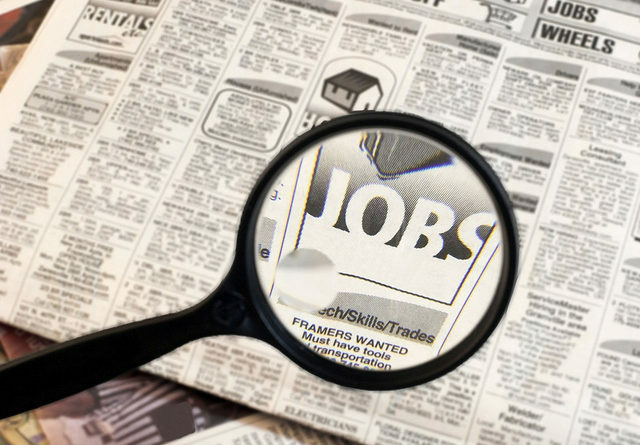 Job Fairs are filling the November Calendar in Williston. Job Service North Dakota lists UPS with the first job fair on November 1. At least four other job fairs are scheduled for November in Williston, including Oil States Energy Services, Halliburton and Kinder-Morgan. "Job fairs are a successful and important tool Kinder Morgan uses to recruit top talent," said Mary Gorton, Kinder-Morgan's human resource representative in the Bakken Region. 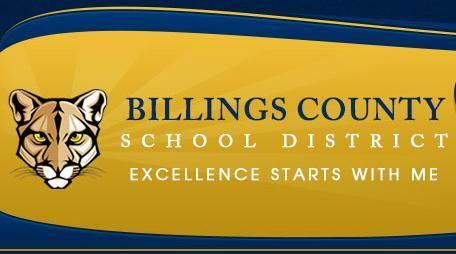 Parents of school children in Billings County School District are mailing back a questionnaire about their feelings and the impact a 4-day school week could have on their family. District Assistant Principal Danielle O'Brien said this morning, "We haven't gotten all the surveys back, but there's enough interest to move forward with a community forum." O'Brien said the idea of a 4-day school week can be a balancing act with the needs and desires of families, students, faculty and staff. "We don't want people to lose hours or wages and benefits," she said. If the surveys from parents continue to show interest in exploring the idea, a community forum with business leaders and anyone else in the community will be scheduled. Click here for more from KX News. Friends and colleagues of Jason Spiess, best known for his work as producer of The Crude Life Media Network, have organized a fundraising effort to support the multimedia journalist who was diagnosed with colon cancer earlier this year. 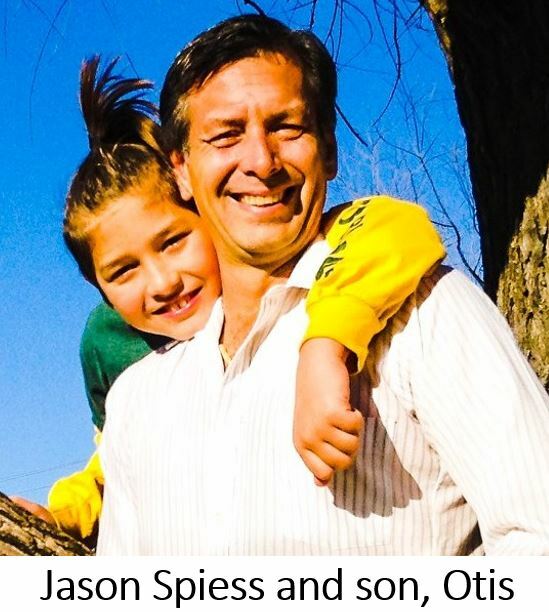 Throughout his arduous journey, Jason has maintained his love and investment in his 12-year-old son, Otis. But his cancer treatment and complications have sapped Jason’s energy. He is host of three radio programs, Building the Bakken, MonDak OilField Review and Coffee & Capitalism, that are broadcast in five states and three Canadian provinces. 1. Donate! Your donation will be increased by 20% by Lend A Hand Up. Click here to donate. 2. Come to the benefit Friday, Nov. 9, at 7:00 pm in Fargo. For additional details or tickets, click here. 3. Donate a silent action item for the benefit on November 9. If you have an item, contact Erik Hatch. The goal of the fundraising effort is $50,000. You can read more about Jason, where he's been, and how he’s doing on his Facebook page. 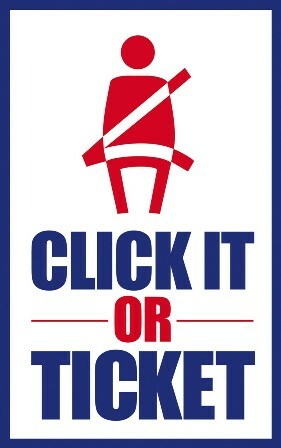 Law enforcement across the state will have extra patrols from November 1 through December 13 for the Click It or Ticket campaign enforcing the state seat belt law. In 2017, one unbelted vehicle occupant died every seven days in North Dakota. The seat belt campaign is part of the Vision Zero strategy to eliminate motor vehicle crash fatalities and serious injuries on North Dakota roads. Tribal members file lawsuit over highway shutdown during DAPL protest -- A.P. New Mexico man sentenced to 16 months in Dakota Access pipeline protest -- A.P. 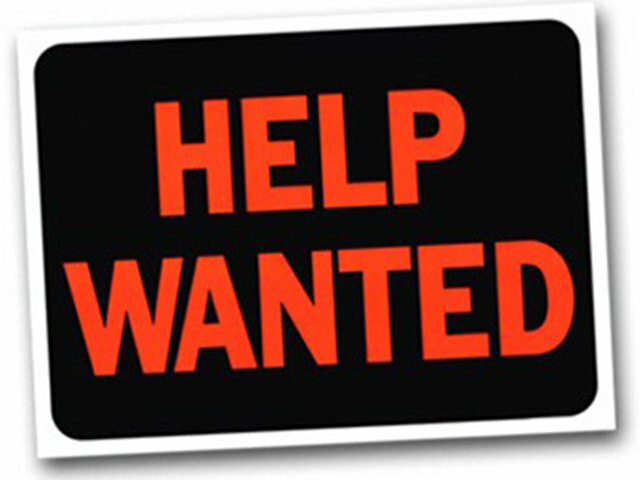 Approximately 88,300 or 60% of the people working in the oil and gas extraction industry are non-supervisory. Their average hourly wage is $36.14. Their average workweek is 41 hours, earning about $1,500/week. Petroleum engineers received the highest average annual earnings in 2017 at $154,840.